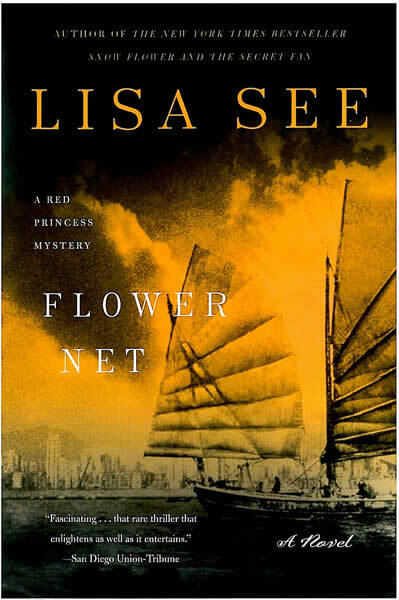 In Flower Net, Lisa See rips the veil away from modern China, its venerable culture, its teeming economy, its institutionalized cruelty, and highlights the inextricable link between China's fortunes and America's. This is a Gorky Park for our time, a complex, suspenseful, beautifully written novel in which a Chinese cop and an American attorney team up to uncover the deadly conspiracy of Chinese gangs, government and big business that lies behind a series of gory, high-profile murders. In the depths of a Beijing winter, during the waning days of Deng Zioping's reign, the U.S. ambassador's son is found dead, his body entombed in a frozen lake. Almost simultaneously, American officials find a ship adrift in the storm-churned waters off Southern California. No one is surprised to find the fetid hold crammed with hundreds of undocumented Chinese immigrants, the latest cargo in the Chinese mafia's burgeoning smuggling trade. What does surprise U.S. District Attorney David Starke is his discovery that among the hapless refugees lies the corpse of a "Red Prince," the name given to a child of China's political elite. The Chinese and American governments both suspect that the deaths are linked and, in an unprecedented move, they join forces to solve this cross-cultural crime. Stark heads for Beijing to team up with Liu Hulan, whose unorthodox methods are tolerated only because of her spectacular investigative abilities. Their investigation carries them (and the reader) into virtually every corner of today's China, from the glitzy karaoke bars where the nation's new elite cut deals, to the labyrinthine hutongswhere working-class Chinese have lived and died for centuries. Here is China as readers have never seen it: a surpassingly strange nation at once admirable and frightening. Here too is an utterly original story more taut and timely than anything else on the fiction shelves today. "See applies her knowledge of Chinese customs and traditions to a complex and exciting novel..."
"Flower Net is a lively, exciting page-turner, full of creative twists and unexpected turns. It leads the reader into a mysterious Chinese alchemy that is strange and fresh and highly entertaining."